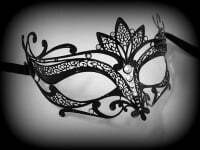 This stunning mask really is eye-catching, incredibly striking & contemporary to wear to any ball or party. 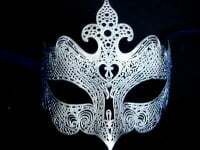 Showcasing the statement style that Simply Masquerade is famous for, this fabulous Occhialino Lux Filigree Mask - Silver Plus will lend every look a jet-set attitude. Guaranteed to make you feel like you've just stepped off the catwalk, this stunning & delicate silver phantom shaped mask is modern and distinctive and is embellished with genuine glittering red Swarovski crystals for just the right amount of eye-catching glamour. Injecting edgy designer style to any look, wear yours to the next party or ball for maximum impact. 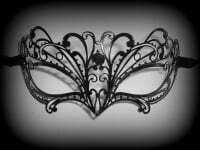 A masquerade mask for a man or women.